is an immersive tribute to 100 years of pride and passion. 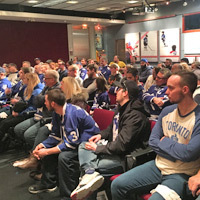 The exhibit pays homage to those who have worn the blue and white as well as highlights some of the most iconic moments in franchise history. 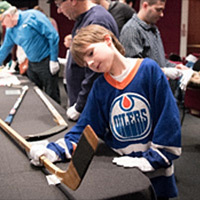 Artifacts on display include Bill Barilko's Stanley Cup-winning OT puck, the stick used by Tim Horton during game seven of the 1964 Stanley Cup final, Mats Sundin's jersey from the final game at Maple Leaf Gardens, plus many more unique treasures, like those seen below, spanning from Conn Smythe to Morgan Rielly. 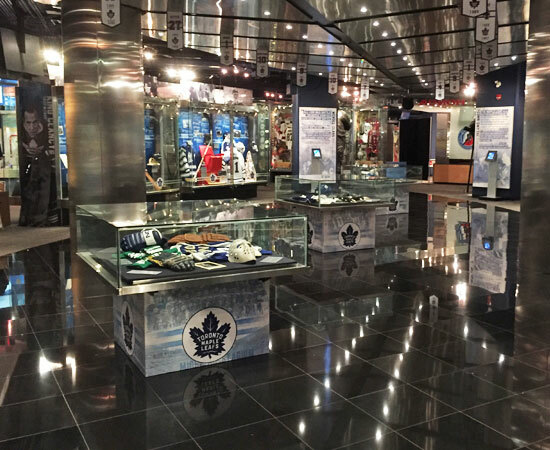 This exhibit is truly must see for every Leafs fan. On now until March 6, 2017. 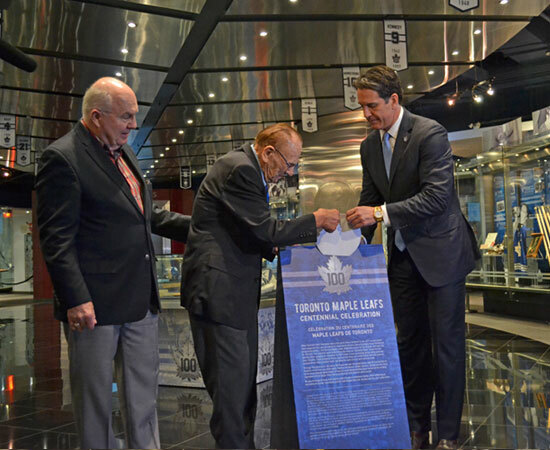 Ron Ellis, Johnny Bower and Brendan Shanahan officially unveil the limited-time time Toronto Maple Leafs Centennial exhibit. 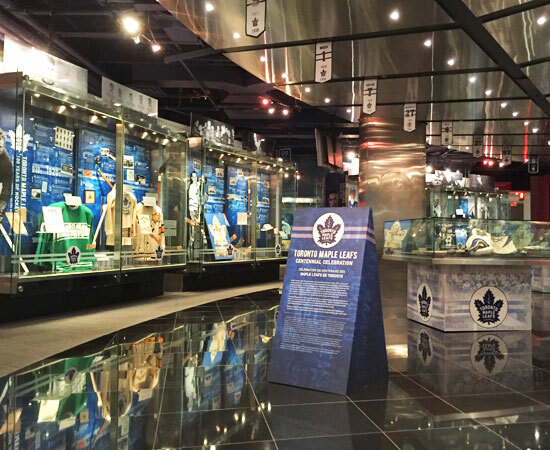 The limited-time Toronto Maple Leafs Centennial Exhibit is an immersive tribute to 100 years of pride and passion. 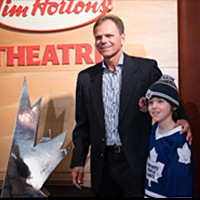 would set Maple Leafs single-season records for assists (95) and points (127). Artifacts on display span generations, from the gloves worn by Busher Jackson to the mask worn by Ed Belfour. 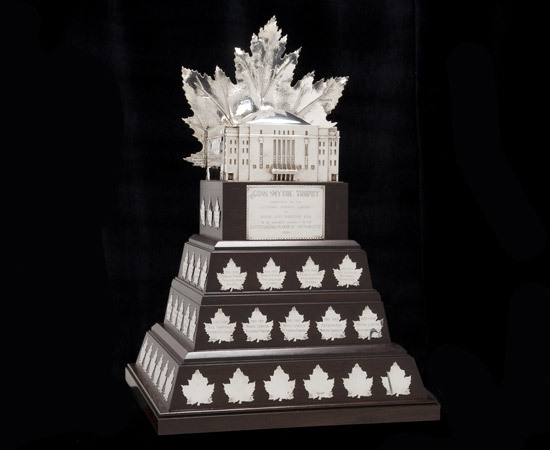 The Conn Smythe Trophy, presented annually to the NHL playoff MVP, is a tribute to the former coach, general manager and owner of the Toronto Maple Leafs. 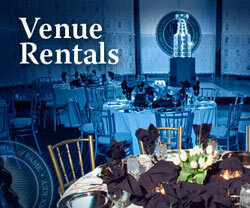 and overtime Stanley Cup-winner on April 21, 1951. 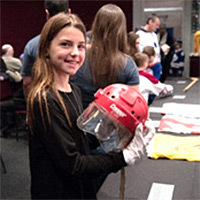 Artifacts on display include the mask and skates worn by Johnny Bower during the 1960’s. 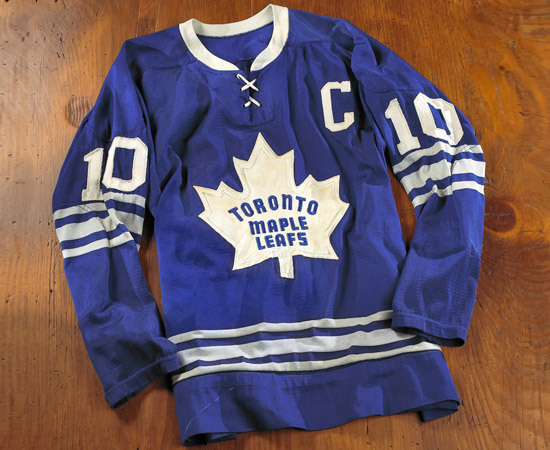 Long-time Maple Leafs captain George Armstrong wore this jersey throughout the 1966-67 season, leading the club to their fourth Stanley Cup title of the decade. Prior to the 1961-62 All-Star Game, Toronto agreed to sell Frank Mahovlich to Chicago for $1 million. 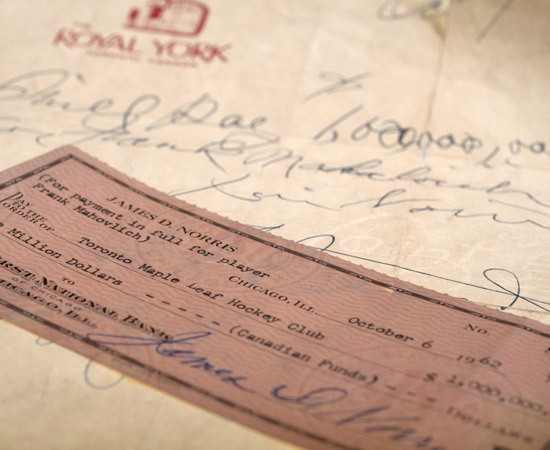 The Leafs later reneged on the deal and the cheque went un-cashed. Johnny Bower and his daughter visit with his Honoured Member display. 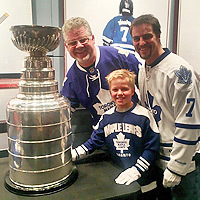 Part of the Toronto Maple Leafs Centennial exhibit at the Hockey Hall of Fame. 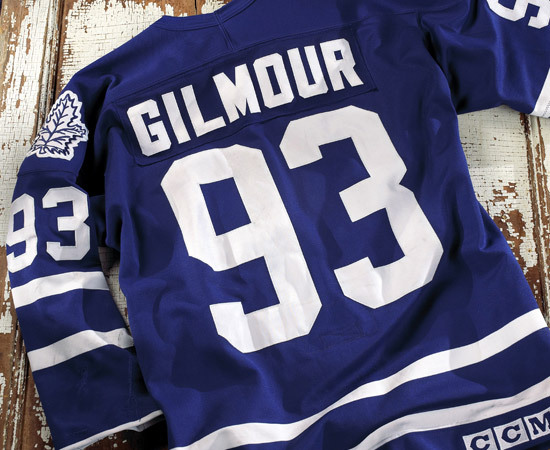 and so many more have inspired generations of Maple Leafs fans. "Great day from beginning to end! Couldn't have asked for a better day!" 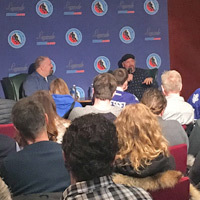 a living legend like Wendel. one I won't soon forget!" nights for all of my childhood. 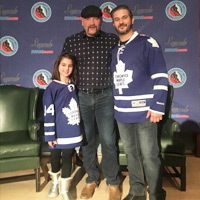 Leafs of that era had together. that we will reflect on for years to come." 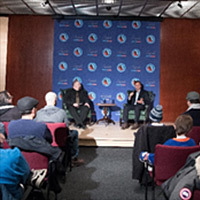 son had such a great experience." them questions in a very up close environment. my 2 young boys loved it!!" 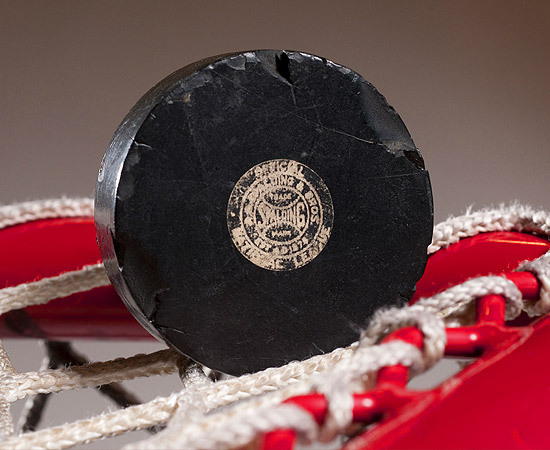 Bring a piece of hockey history home. 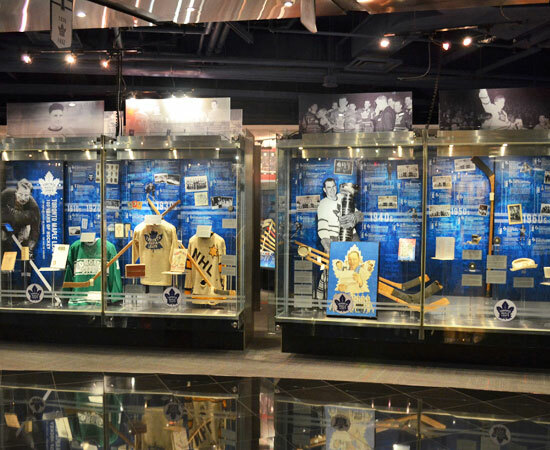 The Hockey Hall of Fame is providing you the opportunity to purchase their street banners commemorating the Toronto Maple Leafs Centennial Exhibit. A unique collectible, each banner measures 2ft 3" W x 5ft 9" H.
Only 90 banners are available. COST: $100 (plus HST) + shipping & handling. 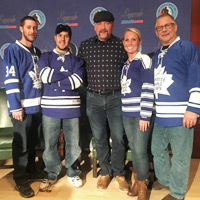 Each banner includes a certificate of authenticity and two (2) Hockey Hall of Fame tickets valid until December 31, 2017. Centennial Exhibit is on until March 6, 2017. A limited number of street banners are available. A maximum of 8 banners per person. Shipping & handling fees are $25 for Ontario addresses. 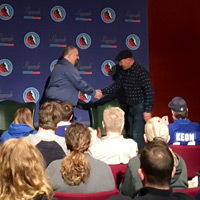 Option to pick up order at the Hockey Hall of Fame is available. Banner colour subject to availability. Purchases are non-refundable. 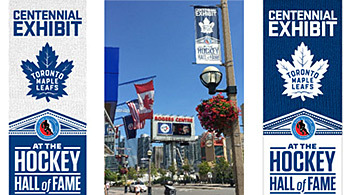 All banners were pre-used during an outdoor street banner campaign. 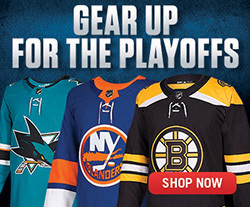 Although banners have been cleaned, slight residue and wear may appear - much like game-used jerseys.